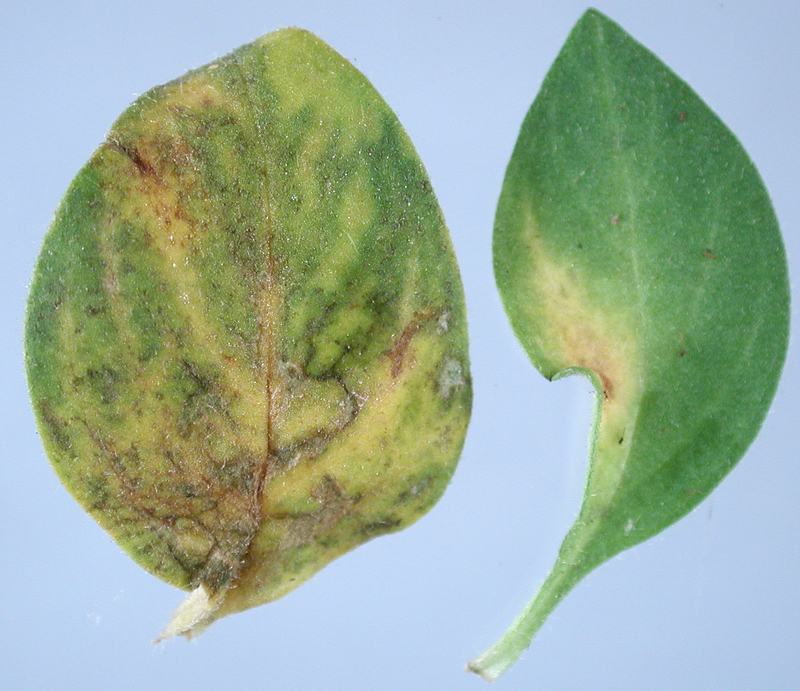 Plants infected with TMV have mottled green and yellowish green deformed leaves. Plants infected with TMV can also have necrotic lesions as well as deformed leaves. Plants infected with TMV may have very subtle mottling of the leaves. Cause Several viruses have been a problem on petunia including Cucumber mosaic virus (CMV), Tobacco mosaic virus (TMV), Beet curly top virus, and Impatiens necrotic spot virus. Other viruses reported on petunia include Potato virus Y, Tomato mosaic virus, Alfalfa mosaic virus, Tomato ringspot virus (ToRSV), Tobacco streak virus, Petunia vein clearing virus, and Broad bean wilt virus 1. 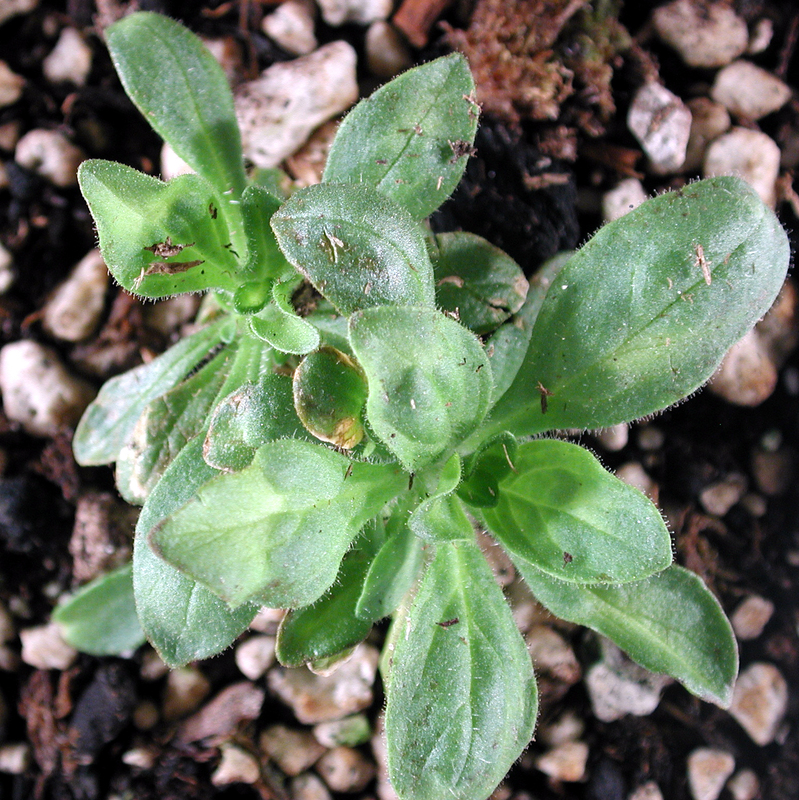 A newer virus causing leaf mottling in 2012 was provisionally named Petunia chlorotic mottle virus (PCMoV). CMV is spread by aphids, TMV by infected plant to healthy plant contact, workers with contaminated hands who handle the plants and with contaminated tools during propagation. TMV is very stable and may survive on greenhouse benches, tools and other surfaces for months. Curly top is widespread, fairly common, and vectored by the beet leafhopper. Infected plants are damaged aesthetically. Symptoms Plants infected with TMV have mottled green and yellowish green deformed leaves. Necrotic tip dieback, strapped shaped or rat-tailing of leaves and yellowing along the leaf veins is also possible. Blossoms usually are deformed and mottled and could also have a color break. Plants are stunted. Many infected plants may show no symptoms at all. Plants with beet curly top usually are stunted and have mottled, deformed leaves. Incoming plants from other operations should be carefully screened for diseases symptoms. Remove and destroy diseased plants. Workers should wear disposable gloves. Plant handlers, especially those who use tobacco, should wash hands thoroughly with soap before handling petunias. Contaminated surfaces should be disinfested using any of several products including a 1 to 10 dilution of bleach or a 20% solution of nonfat dry milk (plus a surfactant). References Bratsch, S., Lockhart, B., and Mollov, D. 2017. 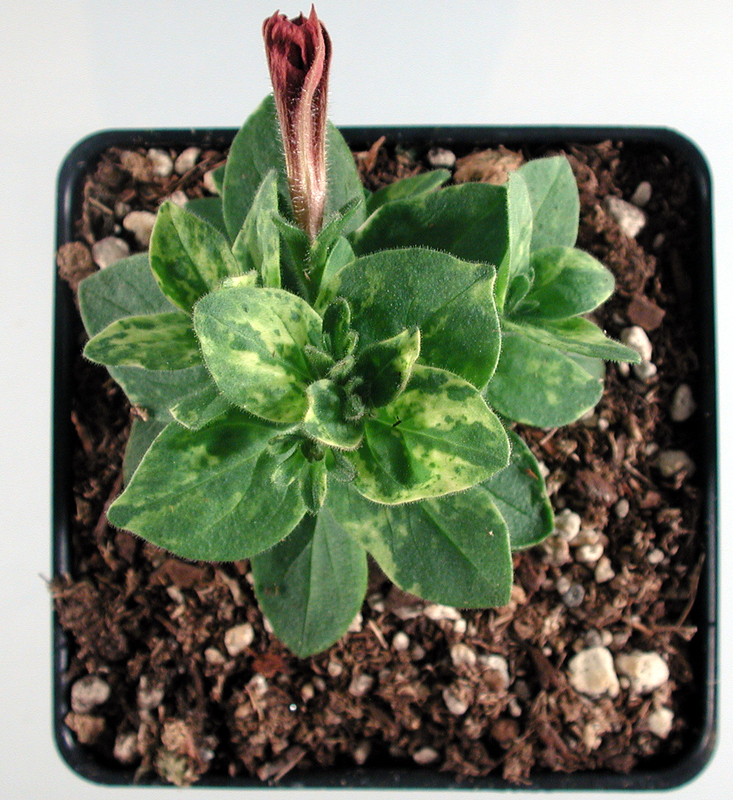 Characterization of a New Nepovirus Causing a Leaf Mottling Disease in Petunia hybrida. Plant Disease 101:1017-1021. Kim, B.S., Ruhl, G., Creswell, T., and Loesch-Fries L.S. 2014. Molecular identification of a Tobacco mosaic virus isolate from imported petunias. Plant Health Progress doi:10.1094/PHP-BR-14-0018. Lewandowski, D.J., Hayes, A.J. and Adkins, S. 2010. Surprising results from a search for effective disinfectants for Tobacco mosaic virus-contaminated tools. Plant Disease 94:542-550.